I am a web developer and I want to give severing a try. I'm a beginner-intermediate when it comes to linux. I set up a (L)AMP stack on windows through a software called "WAMP". After forwarding my local IP, and a few clicks later, I had a website broadcasting via my public IP. Now I want to do it the fun way, so bought myself an old $25 C2Duo computer. Installed a fresh copy of 14.04 ubuntu server, selecting OpenSSH in the installation and installing apache2 via command line after I had logged in - "sudo apt-get install apache2". That's the ONLY thing I have done to this computer. I have forwarded the port on the router. I can browse the start up page from localhost, and by visiting the server's local IP from another computer, but I can not browse the site via my public IP address. Are there more settings I need to change? I had the exact same problem on my test ubuntu server. 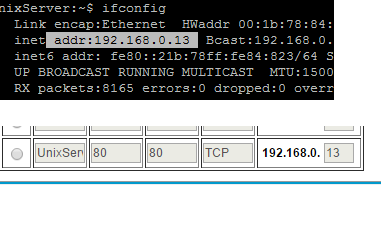 ifconfig vs my port forward setting. Did you setup port forwarding on your router to send the traffic on to the server system? Also, you can use no-ip (free) or buy a domain and point the A record to your WAN IP and you can then use the name to access the server just like you do with the rest of the website you use. Yeah, I intend to buy a domain after I get the whole thing set up. The router is set up to forward all traffic from port 80 to the correct IP address. The response I get from the browser when trying to connect to my public IP is "connection refused"
You may need to tell apache to accept requests from outside the LAN. I believe there is a confirmation in the service for this. Thanks for the response. Just tried rebooting the router, no different. Any idea how I could do that? Provide an answer of your own, or ask David for more information if necessary.